Namrata Shirodkar is sharing family secrets on Instagram and the latest one is about Mahesh Babu and their daughter Sitara. 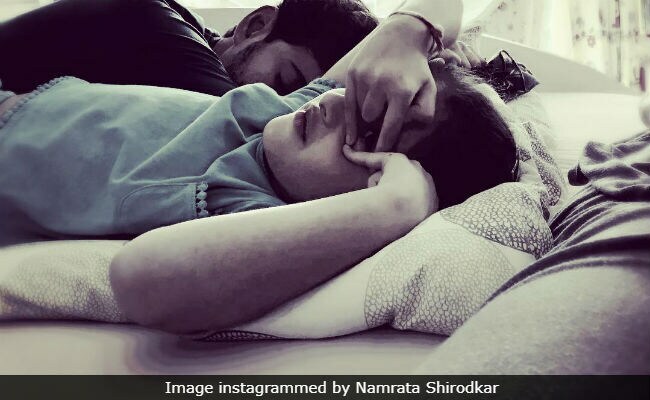 Namrata instagrammed a picture of Mahesh Babu and Sitara, in sleep mode on. But if Namarta Shirodkar is to be believed then they were 'pretending' to be sleeping. Oops! Namrata Shirodkar'a post has several comments ranging from 'adorable' to 'so cute.' The picture, which now has over 80,000 likes, appears to be taken during their recent family vacation to Ko Samui. Namrata Shirodkar and Mahesh Babu along with their son Gautham and daughter Nitara were holidaying on the island in Thailand recently. On the work front, Mahesh Babu was last seen in critical and commercial hit Bharat Ane Nenu while his next project is Maharishi. The first look of the film was launched on his birthday while the film's logo was launched by his daughter Sitara. Mahesh Babu has apparently already completed the film's first schedule in Dehradun. In Maharishi, Mohenjo Daro actress Pooja Hegde has been cast opposite Mahesh Babu. Maharishi is directed by Vamshi Paidipally. Mahesh Babu married Namrata Shirodkar, his co-star of Vamsi, in 2007. Namrata, a former Miss India, quit films after getting married. She was last seen in Bride And Prejudice.